We are one of the few suppliers with a Kiwa / Komo certificate for our systems. This is achieved in accordance with Eurocode. You can locate our certificates on the Kiwa website under BRL 2342. SFS lagoon mixer, designed especially for the larger foil lagoons and lagoons with manure that is difficult to mix. Mix hatch, which allows the manure to be mixed by a contractor, for example. Circulation pump system by means of nozzles and a displacement pump. SFS Foil lagoon, for manure storage, amongst other things. The SFS Foil lagoon is equipped with an optional floating cover. 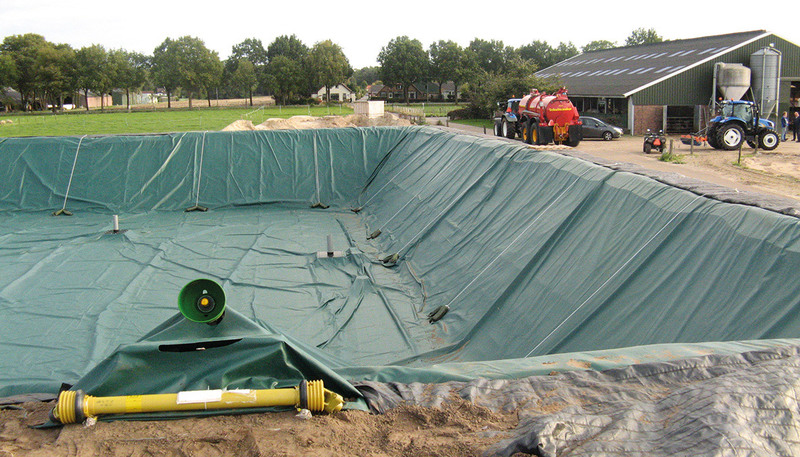 This is an inexpensive and reliable solution for your manure storage needs. Legal inspection requirements in the Netherlands. We recommend that you also adhere to these requirements outside of the Netherlands, for a system which will function properly for years to come. The SFS Foil lagoon can be supplied in all sizes and for customised orders. The potential volume is unlimited. An example of a standard certified system is; a bottom-seal constructed of 1 mm Fecatex PVC, with a floating cover constructed of Genatex 850 gram/m² reinforced PVC foil. 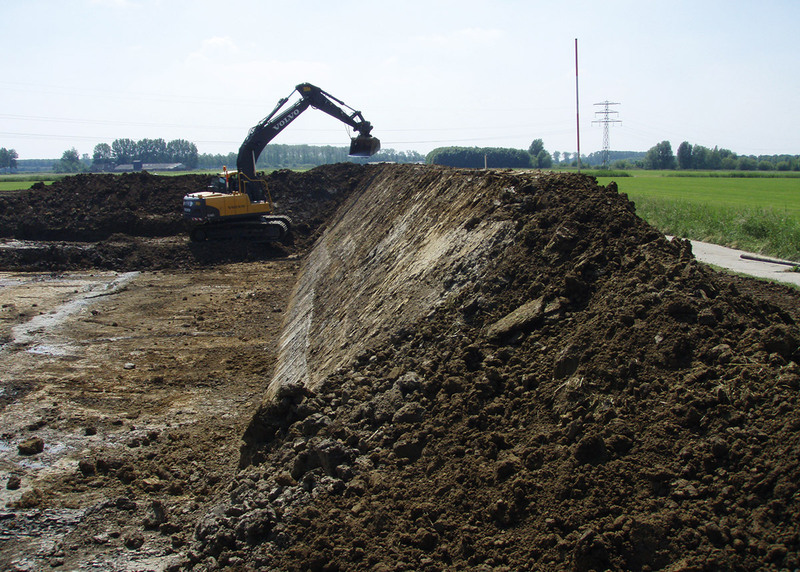 The dyke's exterior can be covered with slope protection, which means the dykes will no longer be prone to overgrowth. A 1.80 m tall fence is a legal requirement, and we are able to supply this fence and / or install it. All required pipe systems can also be supplied. 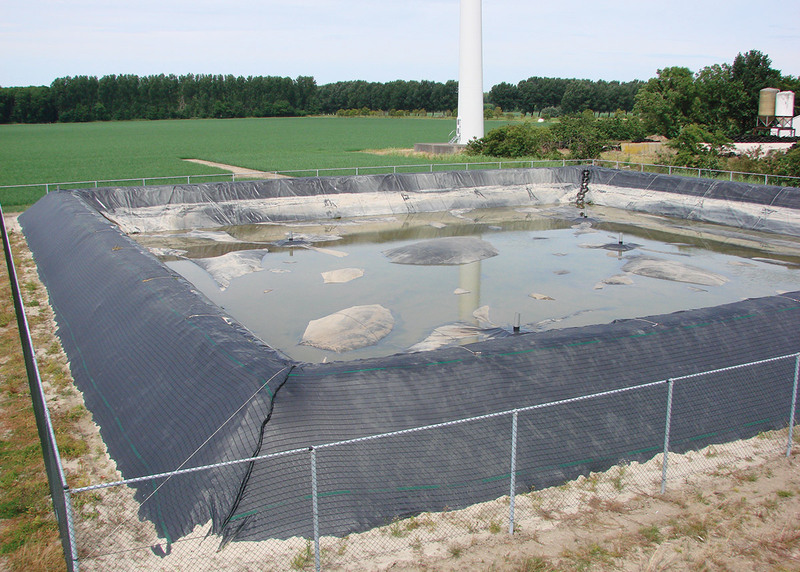 We are also able to construct the SFS Foil lagoon using all types of foils suitable for manure storage. Working with our own assembly team or assembly under supervision, and using a supporting committee for the application of building permits and / or environmental irregularities. We relieve you of all your concerns!